Certain professions demand certain skill sets and certifications. Increase your marketability by spotlighting your professional development in the Certifications section. Add the certifications, licensures, and clearances you’ve earned and courses you’ve taken throughout your career to your profile. Many people enter certifications in the Education section of their profiles. At one time, the LinkedIn profile didn’t contain these extra sections, and the only way to record a certification was to add it as part of the Education section. Remember, the Education section is where you enter degrees received. If you received a certificate, enter it in the Certifications section. If you have the Certifications section already added to your profile, simply scroll to it and click the pencil (edit) icon to enter into edit mode, then go to Step 5. If you don’t have the Certifications section added to your profile yet, scroll below the Contact Information section at the top part of your profile and click the View More link to see a full list of sections to add. In the Certifications section, click Add Certifications. When clicked, the Certifications section appears on your profile. Type the name of the Certification in the Certification Name field. Enter the Certification Authority in the next field. The Certification Authority is the trusted organization or company that issued the certificate. They are the ones guaranteeing your knowledge or ability. Enter the License Number in the License Number field. In the Certification URL field, add the website address where more information on this certification can be found. In the Dates field, choose the month and year from the drop-down lists. If the certification has no end date, place a check mark next to This Certificate Does Not Expire. 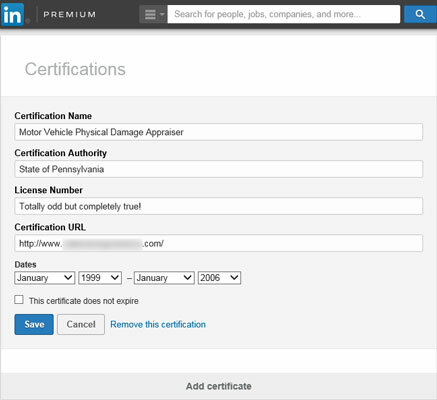 Adding a certificate to the Certifications section.